September is Whole Grains Month! 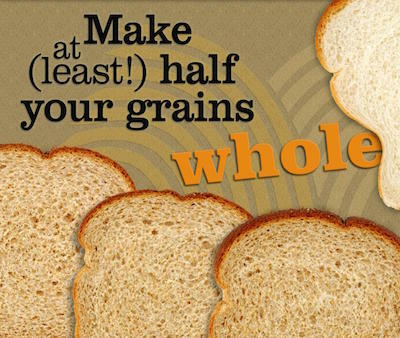 Learn why it’s important to choose whole grains. Refined grains — such as white rice, white flour and white bread — are milled, a process which removes the bran and germ to extend shelf life and improve texture. Unfortunately, this refining process also “strips away more than half of wheat’s B vitamins, 90 percent of the vitamin E, and virtually all of the fiber” (Harvard School of Public Health). The Dietary Guidelines for Americans recommends that at least half the grains you eat are whole. So, how can you incorporate those healthy whole grains into your diet? Start your day off with whole grains by eating oatmeal or buckwheat pancakes for breakfast. Add quinoa or wheat berries to your salads. Cook soups with barley or soba noodles. Snack on popcorn. It’s a whole grain and can be a healthy snack if you cut back on added salt and butter. Making a sandwich? Build it on a whole grain pita or slices of sprouted grain bread.